Call of Duty is not supposed to be good, so the idea goes, especially not Call of Duty: Modern Warfare 2. The sixth Call of Duty has been described as a jingoistic mess, a Michael Bay-esque cacophony of nonsensical story bits, a mere shooter that couldn’t—shouldn’t—try to be anything more. “It’s Call of Duty” has become its own insult. This is a mistake. Call of Duty: Modern Warfare 2 has been mischaracterized. Defamed. Maligned for far too long. It deserves better. I’m going to tell you why. Before we get to Modern Warfare 2, however, we’re going to need to establish some context. If there’s one thing any shooter fan has to accept, it’s this: people think shooters are dumb. Shooters are games anyone can play—they don’t rely on Byzantine rules or flawless controller skills. A broader range of players can pick up and enjoy a shooter than, say, a JRPG or a 4X game. It’s like chess in that regard—the barrier to entry is almost non-existent, but the skill threshold is practically limitless. Since just about anyone can play a shooter, you get a wide range of players, from the smart and skilled ones, to the dumb and clumsy ones. The latter color perception of the game, so the most popular shooter at any given moment will always be seen as dumb entertainment. You had that with Doom; you had that with Counterstrike and its own brand of crazed stereotypes. After that it was Halo. In 2007, Call of Duty 4: Modern Warfare was released, changing shooters forever. It became the new top dog, and, as a result, the new target. Up to this point, Call of Duty was respected. It was innovative. Fresh. It did its best to put players in the shoes of soldiers, or, at least, of the movie characters who played them. Playing the first two games and the Grey Matter-developed expansion, United Offensive, you might recognize set pieces from Band of Brothers, Saving Private Ryan, or Enemy at the Gates. It’s not really that surprising when you consider that Steven Spielberg, the director of Saving Private Ryan and producer of Band of Brothers, helped create Medal of Honor, from which most of the Call of Duty designers originated. Call of Duty worked because it did the thing that first-person games are best at: placing the audience right in the middle of the game, letting them become part of the action. Developers use predetermined events, called “scripted sequences,” to help sell the experience. Games have been doing this forever—Half-Life and its sequels were acclaimed for popularizing the concept. Call of Duty took it further, delivering some of the most memorable levels in gaming history, like All Ghillied Up. When Call of Duty eclipsed Halo, public perception towards the series changed. People loved Modern Warfare, sure, but its success meant that what came next would not fare as well. Shooters, after all, are supposed to be dumb. Now that it was the top dog, one of the most successful games in history, public perception of the game and its players was that it would be dumb. This is what Modern Warfare 2 faced from the public. Things weren’t going so well in private, either. 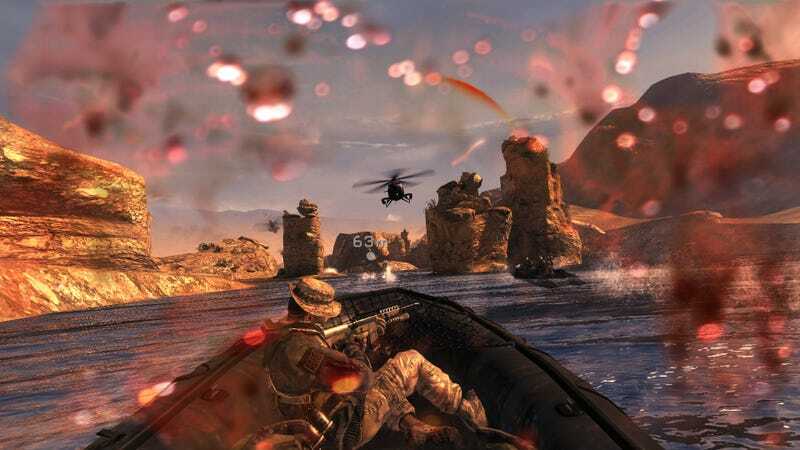 Post-release interviews and legal documents show a troubled production, which went something like this: Infinity Ward made Call of Duty to establish themselves as a developer. Their second game was to be an entirely new creation, set in modern times—the game that would become Modern Warfare. Activision, the series’ publisher, wasn’t wild about that, attempting to prove to Infinity Ward that a Modern Warfare game would never sell. The developer and publisher finally came to an agreement, setting up an arrangement where Infinity Ward would have to create a second Call of Duty set in World War II in order to make Modern Warfare. Not only that, but Modern Warfare would have to be a Call of Duty game, and Treyarch, the developer that had absorbed Grey Matter, would develop two Call of Duty games on their own, both set in World War II. Modern Warfare was supposed to fail. And then it became one of the most successful games of all time. Activision decided it wanted another one. I’ve heard rumors that Infinity Ward had originally planned something called ‘Future Warfare’ for their third game. Activision, however, promised big bonuses to the developers, who reluctantly began work on a second installment in the Modern Warfare branch of the Call of Duty tree. 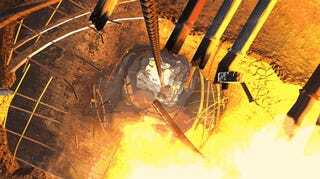 Modern Warfare 2 became the largest launch of any media product in entertainment history, bigger than any movie, bigger than any Grand Theft Auto game… bigger than anything. Unfortunately, things weren’t going so well at home, which resulted in an ugly lawsuit that ripped Infinity Ward apart. So, this is Modern Warfare 2, a game expected by its audience to be dumb, as shooters are often unfairly portrayed, and a game that went through a troubled development process from a publisher that appeared not to trust its developers. Reviewers called it a muddled mess, a jingoistic, Bay-esque explosion fest that glorified war, demonized foreigners, and generally didn’t make a lot of sense. I’ve read hosts of articles detailing its apparent plot holes or troublesome subject matter. Heck, two of my favorite critics, Film Crit Hulk and Noah Caldwell-Gervais, think the game’s pretty bad. There’s no way this could be good, right? It’s good. And It actually makes sense. Nearly every objection I’ve seen to the game’s narrative is explained in the game’s own cutscenes. Consider, for instance, the common objection that “Russia would never invade the US in the real world, so the plot makes no sense.” Well, the opening cutscene in the game explains that this is not our Russia. It’s much more modern, better off, and run by ultranationalists who hate America. In Modern Warfare’s universe, Russia is a bigger economic and military entity than the United States. This is key to understanding the story: America is not the big dog, and this is not the real world. There’s a reason for this role reversal—in fact, it’s the entire point of the game, and we’ll discover this as the story evolves. Here’s the plot: After the initial training levels, a group of British SAS retrieve an IFF (Identification Friend or Foe) transponder from a downed American satellite. The Russians who have it aren’t keen to let it go; the implication is that they’re trying to crack the transponder, and they may have downed the satellite intentionally. An undercover American operative engages in an act of terrorism at the behest of Makarov, an ultranationalist. The American is killed, his body recovered by the Russians and identified. This spurs the Russians to invade the United States of America. If you think this motive for invading another country is ridiculous, well, read on. 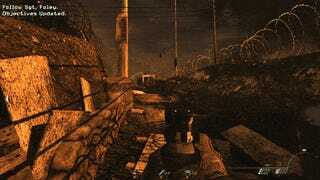 The rest of the game involves the discovery that Price, who was believed to have died at the end of Modern Warfare, was still alive. 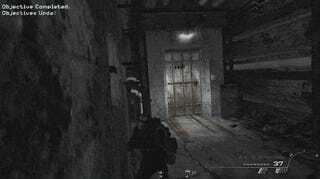 His group, Task Force 141, hunts down the ‘real terrorists’ but fail to apprehend Makarov. Then, surprise, surprise, the American General who sent the undercover operative to the terrorists in the first place turns out to be evil, having tried to spark a war because he felt the military-industrial complex was losing power and needed a reason to continue. The game ends with you hunting the General in Afghanistan. America would do those things. America has done those things. If there’s one thing you need to understand about Call of Duty: Modern Warfare 2, it’s this: this is a game condemning America’s political behavior for the past several decades, and it’s doing it by putting its audience in the shoes of everyone involved in the conflict. One of Call of Duty’s big draws is variety—the developers take you from location to location, creating a wonderfully diverse combat experience. It wouldn’t make much sense for one soldier to fight from Normandy to Stalingrad to Norway, of course, so Call of Duty switches character narratives to make things interesting. Modern Warfare let us play as Sergeant McTavish during some missions, Sergeant Jackson during others, and Captain Price. This leads to some great storytelling moments, like dying as Jackson after the nuclear explosion mid-way through the game. Modern Warfare 2 does the same thing in a more interesting way. By placing players inside a character’s head, these games allow the audience to see multiple perspectives on the same series of events. For example, when a nuclear missile is put into play, you play first as someone watching it launch, then as an astronaut watching it detonate in space, and finally as a soldier on the ground in the eerie silence after the missile’s electromagnetic pulse has disabled all electronics in the area. This isn’t just about taking you to cool locales or switching characters in a 24-esque approach to dramatic pacing. It’s about putting you in a number of roles surrounding real-world events. You are the equivalent of a 9/11 terrorist one moment. You are the victim of an invaded country the next. Even Task Force 141’s characters have a role to play. You think a final level set in Afghanistan, hunting down American soldiers was just a random decision? It’s not. It underscores the entire narrative. You’ve been a victim of human horrors, and you’ve perpetrated them as well. Modern Warfare 2 tells stories in a way no other media can: by putting you in the shoes of the people playing the game and then asking you how you feel. “This is not right,” it says of the wars in Afghanistan and Iraq. Modern Warfare 2 is denouncing America, not Russia. The reason you’re an American is because it’s a game intended for American audiences. Someone invades America so that you, the audience, can experience some semblance of what it’s like to have your home turned upside down. Modern Warfare 2 conjures up and destroys familiar sights in order to hammer this home: this isn’t right. Invading another country as a reaction to the choices of a few is never justifiable. At the same time, it’s condemning the Military-Industrial Complex: as an individual human being, General Shepherd’s goals make little sense. Shepherd isn’t a person, though. He’s the manifestation of an idea. A symbol. He is physical manifestation of the philosophy that says “yeah, let’s keep wars going, let’s spend as much as we can on the military, let’s sell as many American flags as possible.” He peddles death and disguises it as patriotism. For a game supposedly all about jingoism, Modern Warfare 2 often condemns it. As with previous Call of Duty games, a quote pops up on screen every time you die. Modern Warfare 2’s quotes are thematically coherent, railing against the insanity of nationalism disguised as patriotism, and sometimes even condemning patriotism itself. This is not a simplistic techno-thriller with confusing motives: Price wants Makarov. Shepherd wants a fully-funded, excessively-manned military, with no consideration for human lives. Task Force 141 wants to clear their name. Makarov and the ultranationalist government want the same thing: the elimination of other nations in a world where national warfare makes little sense. Modern Warfare 2’s most frequently-cited “mistake” isn’t a mistake at all. Russia invades the US because the audience, largely Americans, are supposed to see what it’s like to have their homes destroyed by a bigger, meaner power. The breathtaking destruction of Washington is designed to evoke a sense of panic as America’s biggest landmarks are torn to pieces. The choices behind Modern Warfare 2 are deliberate and purposeful. ...mixed with some Michael Bay. People often compare the Call of Duty series and games like it to Michael Bay’s films because of tone and style: it’s got a lot of American military imagery, flag waving, and explosions. That’s all well and good, but Modern Warfare 2 took it a step further, deliberately referencing Michael Bay’s best movie, The Rock. Early on in Modern Warfare 2, prior to the rescue of Price, players use little underwater scooters to attack an oil rig. These scooters are similar to the ones used by Sean Connery, Nicolas Cage, and the rescue team in The Rock, but it doesn’t end there. The prison Price is being held in has a set of showers virtually identical to those in The Rock. Finally, remember the climactic moment atop the White House? The one with the green flares? Yeah, that came from The Rock too. Call of Duty isn’t just relying on Bay for stylistic decisions. It’s homaging his finest work. Modern Warfare 2 is unashamed of its connection to Bay, and I can’t help but admire that brash admission of enjoyment. For a while, one story detail bugged me: Makarov and the ultranationalist government are on the same side. The opening narration and later story details confirm as much: everyone there reveres Imran Zakhaev, the Russian terrorist responsible for the events of the first Modern Warfare. The airport that Makarov attacks is literally named after him. So why did Makarov attack it? Why attack his homeland? The story’s got a bit of a Truther narrative going on. Remember, prior to the attack, the Russian government obtains IFF codes that it later uses to invade the United States. They had the means to invade the United States in Modern Warfare 2, but not the motive. Makarov provided that. It seems as if Makarov provided the excuse for them to invade—they were already planning the attack. Unfortunately, because of this, the story rings a bit of the “9/11 was an inside job to justify America’s invasion of Iraq and Afghanistan” elements. Russia’s invasion of America needs to happen for Modern Warfare 2 to achieve its goals of putting Americans in Iraqi/Afghani shoes, so it has got to happen somehow, and a conspiracy thriller makes sense; it’s even better because Modern Warfare 2 is so clearly drawing parallels between Shephard and Makarov. They may hate each other, but they’re also two sides of the same coin, the manifestation of an ideology that attacks the country it professes to love. So, if it’s a Truther narrative, trying to argue that America attacked itself in 9/11, well, that’s just in poor taste. It’s commonly accepted that this did not happen, and Truthers are widely (and rightfully) regarded as conspiracy nuts. There are plenty of story reasons for this conspiracy to happen, and most revolve around getting to the main point in a simple and exciting way. Which brings us to another problem. Shooters are seen as ‘power fantasies.’ Video games are generally expected to be ‘fun.’ As it follows, Modern Warfare 2 is a load of fun, because it is a first-person shooter video game. It’s a roller coaster of emotions. Some moments are wonderfully tense and others are horrifyingly brutal. It’s a thrill-ride to end all thrill rides. This is great, except for the part where every single component of the narrative is about how war is bad and horrible and awful. On one hand, you’ve got this game that’s trying as hard as it can to be the most thrilling, exciting game it can be, and then it’s got a story that’s using the first-person perspective to let you be all these people dealing with a horrible thing. The places it takes you to, the people it lets you be… they’re all there for a purpose. This isn’t just about shock and awe for the players. It’s about empathy. It’s kinda hard to provide an empathetic experience when you’re telling a story in a medium so heavily coded towards “wow, player, you’re so great! You’re the best! You saved the day! You’re so awesome!” Modern Warfare 2’s fun is at odds with its narrative. But, well… “video games” made sense in the 1980s, when that’s all they were: games on your television. It wasn’t possible to make a game that set its audience in a fully 3D world where people could walk in another’s shoes. The name has stuck—there’s no changing it—but if we resort to formalism, strenuously adhering to the name of the medium rather than exploring what it can really do, we’re going to be stuck with games like Modern Warfare 2: smart ideas that get ignored because they’re expected to be dumb instead. Credit to them for trying something bold. I get it. Some games are dumb. Some are poorly written. Some genres never seem to produce anything good. Modern Warfare 2 was primed to be one of those games, and because it tried to be fun, it sure seemed like that was the case. You’ve heard the phrase “yeah, it’s fun if you turn your brain off”? I get the sinking suspicion that a fair few of Modern Warfare 2’s players turned their brain off while playing, not bothering to watch the cutscenes, listen to the story, or read between the lines when they should have. It wasn’t supposed to be good, so why give it the chance? I totally understand why people would call it dumb. But y’know what? It tried for something greater. Infinity Ward looked at the world around them and made a game that tackled that world head on. Modern Warfare 2 may have fallen short, but I can’t say amidst my hours of Orc-charming, Templar-slaying, Pantheon-felling video games, I’ve played many games that got as far as Modern Warfare 2 ever did.